Happy 15th birthday to us! That’s right–we’ve been the email agency of choice for the world’s leading brands for 15 years. 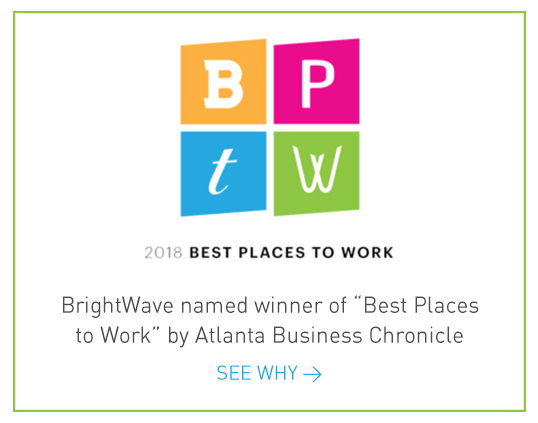 We couldn’t be more excited or proud of what we’ve accomplished in that time, so we’re sharing 15 of our favorite BrightWave facts to celebrate this huge milestone. BrightWave was nautical way before it was cool. Once our CEO Simms Jenkins decided on the name BrightWave, the wave became our mascot. The dynamic symbol, which looks like it’s always in motion, forever changing and innovating, still represents what we’re all about even 15 years later. From there, conference rooms, awards, events and even office decor have been given a tasteful maritime touch. Our name was created via dial up internet and AOL IMs. Jenkins used a highly scientific process to come up with BrightWave: lots of research and IMs with fraternity brothers weighing in on initial names. He ultimately landed on BrightWave as it conveyed (and still does today) motion, energy and communication. We love some friendly internal competition. British Fridays were once a thing at BrightWave. Everyone would speak in British accents and the BrightWaver with the best one got a giftcard to Ted’s Montana Grill. We like beer. We even accepted beer as “payment” once from a client who was one of the earliest microbreweries in Atlanta. One client turned BrightWave into a “real business” overnight. Our first big client was CoreNet Global, a worldwide corporate real estate association who was a client for almost a decade. One of CoreNet Global’s employees, Richard Kadzis, was instrumental in giving Jenkins the confidence, feedback and help that allowed BrightWave to set sail to many things ahead. BrightWave culture is fun. As part of our quarterly team events, we once set up putt putt courses throughout our office, split up into teams and dressed in group costumes for the Mini Golf Masters. Our president dressing up as Scary Spice with his Spice Girl themed team was pretty priceless but the trophy ultimately went to the mustache-wearing, sparkly coat-sporting Mariachi band. Did we mention we like beer? We keep 2 locally sourced brews rotating at the bar in our office. We use the area to entertain, host internal social events, and celebrate things (like our 15th anniversary mimosa breakfast shown above.) And we, of course, made sure our new digs will have another bar that’s even bigger and better. We don’t take ourselves too seriously. We once provided a random couple, who was yelling at each other inside their car parked in our lot, some comic relief. A BrightWaver dressed in a banana costume ran by the car as someone else chased them with a dummy tomahawk–and it totally worked. There’s no stopping our growth. We’re the only email focused company to make Inc. 5000’s list of fastest growing private companies in the US five years in a row. There’s a traditional Asian gong in our bar. 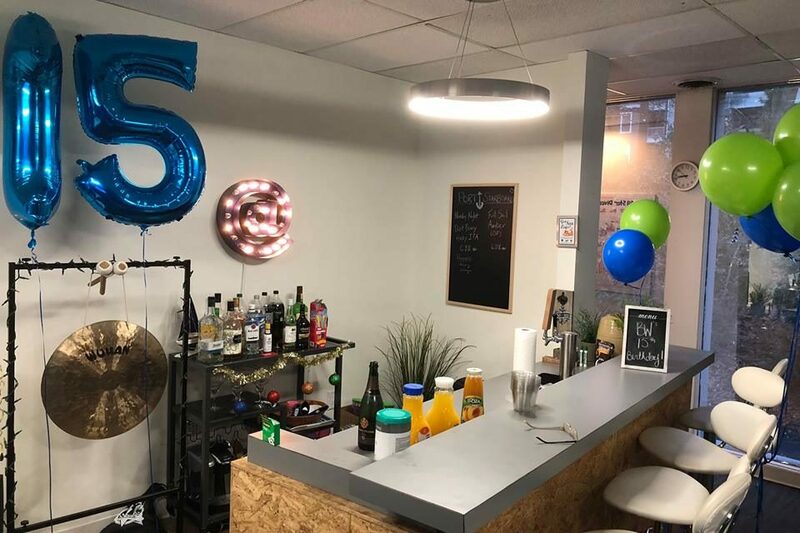 The gong is meant to be rung in celebration when we acquire a new client, but it comes in handy for other things like kicking off company-wide meetings and commemorating the moment EiQ tickets have sold out. We’re in an Atlanta agency bowling league. In true BrightWave nautical fashion, our team name is ‘The Jack Spare-o’s.’ Get it? A few karaoke enthusiasts work at BrightWave. Once a month, we all meet up at a local bar for karaoke after work. While most of us come for the beverages and some good belly laughs, a handful of us belt out some serious notes. We go all out for our annual holiday card. Each year, we send out a BrightWave holiday email and use a new, innovative inbox capability each time. This year, we featured an interactive Christmas Eve screen of our Chief Client Officer eating cookies, drinking beer and delivering presents dressed as Santa. Check it out here if you missed it. Jigsaw puzzles are an office favorite. In our commons area (aka The Siren), there are multiple jigsaw puzzles in the works at any given time. It’s a great way to take a break and recharge your batteries while catching up with fellow BrightWavers. We do a quarterly ‘Day of Awesomeness.’ As the name suggests, our team members spend an entire workday just doing something to brighten other people’s world. But this is totally different from a mandatory community service project—the beauty is that we get to know a little something about our team members based on what they choose. Past projects range from surprise Fiesta Carts for the office to cleaning out and painting a common area at nearby Midtown Church.